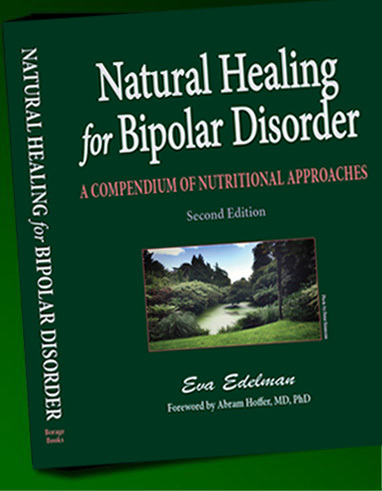 Natural Healing for Bipolar Disorder: A Compendium of Nutritional Approaches is a clear, comprehensive, and extensively documented resource. It provides an overview of stimulating, inhibitory, and stabilizing nutrients and herbs, and of nutrient approaches for contributory factors, including imbalanced brain chemistry (neurotransmitter, receptor, and second messenger issues; methylation status, oxidative stress, seizural problems, toxicity, etc.) and physical illness (e.g., allergies, malabsorption, Candida, endocrine imbalance). It has been highly acclaimed by key practitioners. Second edition, 2018. Foreword by Abram Hoffer, MD, PhD. Contains glossary, resources, recommended reading, and extensive current references. Illustrated. 8.5 X 11, 412 pages, $39.95. ISBN: 9780965097642 LCCN: 2009920436.